Sorry, Bogie, A Sigh Is Not Just A Sigh : Shots - Health News Sighs aren't just signs of resignation, relief or the blues. Involuntary sighs are vital to lung health, say scientists who think they have figured out the brain circuitry that controls the reflex. 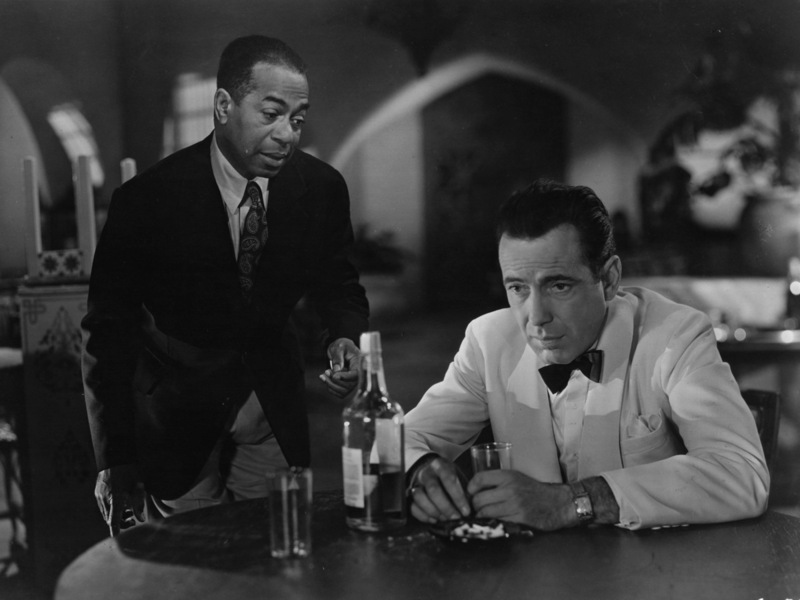 Emotion seemed to fuel plenty of sighs by Humphrey Bogart's character Rick (right) in the 1942 film classic Casablanca, and even Rick's good friend Sam, played by actor Dooley Wilson, couldn't console him. The sighs we notice usually accompany emotions like relief or discontent. But our brains are programmed to make us heave an unconscious sigh every five minutes or so — no matter how we feel. "Sighing is vital to maintain lung function," says Jack Feldman, a brain scientist at UCLA. These periodic deep breaths reinflate tiny air sacs in the lungs that have gone flat. But the brain circuitry behind those reflexive sighs has been a mystery. Now there's strong evidence from studies in rats that the neural wiring resides in a particular part of the brain stem that regulates breathing, Feldman and a team of researchers report in this week's issue of the journal Nature. "We identified a very compact circuit consisting of about 400 neurons," Feldman says. A few years ago, Feldman's lab showed that a substance called bombesin could increase sighing in rodents. "Rats normally sigh about 40 times an hour," Feldman says. After bombesin was injected into the brain area that controls breathing rhythm, he says, "the sigh rate went to 400 times an hour, while the basic breathing pattern didn't change." But it still wasn't clear precisely which cells in the brain were responding to bombesin. To find out, Feldman's lab teamed up with a lab at Stanford run by Mark Krasnow, a professor of biochemistry and investigator for the Howard Hughes Medical Institute. Together, the researchers identified two clusters of cells in the brain stem that responded to bombesin. Each cluster consisted of about 200 brain cells. And each cluster responded to a different form of bombesin. When the researchers blocked one form of bombesin in rats, the animals began to sigh half as often. And when the scientists blocked both forms, the rats didn't sigh at all. It's pretty clear that a similar circuit controls sighing in people, Feldman says. And that means it might be possible to treat some human problems by inducing or suppressing sighs, he says. People with anxiety disorders, for example, may sigh so often that it interferes with their lives. And people who have difficulty taking deep breaths on their own because of conditions such as heart failure or obesity might benefit from more sighing. Of course, scientists still don't understand why certain emotions trigger sighing. "It could be a way of communicating nonverbally," Feldman says. Another possibility is that it's a reflex that helps us calm down. That may be why we tell people who are tense to "just relax; take a deep breath," he says.